I first met Katie Dalebout when she interviewed me on her podcast, Wellness Wonderland (which by the way, will be aired in the next couple months! I’ll keep you posted!). I was extremely impressed by her podcast, her knowledge, energy and mission. You must check her out! AC: I’m so excited to be interviewing the interviewer! Katie, please tell us about the Wellness Wonderland? KD: The Wellness Wonderland is my corner of the Internet for holistic wellness. Holistic wellness has been defined and redefined by my audience and myself over the years. WW started in college as a way for me to express myself in general and creatively. I loved reading blogs. I would identify with the writers and just lust over my favorite blogs like designlovefest.com, cupcakesandcashmere.com and A CUP OF JO. I thought to myself, “Wouldn’t it be cool if I could do something like that?” And so I did! I finally got the confidence and I started blogging. I had no idea of what I was doing! I was super interested in physical health and wellness, almost to a fault. At the time I shared recipes, health tips and yoga stuff. Eventually, the umbrella term of Wellness Wonderland expanded beyond that, because my piqued interest in health and wellness spiraled rather quickly in college into an eating disorder. I was anorexic and orthorexic. I focused a bit too much on healthy and high vibe foods to the point where I was devoid of pleasure in my life. I think pleasure is one of the most important parts of true holistic wellness and health. That bottom led me to spirituality and holistic living in another sense, which looks at the mind. I think holistic wellness goes far beyond the body and it encompasses the mind and spirit. This led me to the work of many, many teachers: Gabrielle Bernstein (one of my main mentors), Louise Hay, Wayne Dyer, the whole gang of like spiritual gurus and rock stars. I became a student and read a ton about self-help and personal development and did much spiritual work. I realized my true passion was teaching spiritual work and the tools that had helped lift me out of that dark place. I didn’t leave behind my interest in healthy food, healthy living and yoga. I just added in some more things and I am slowly bringing in more pleasure. It’s not being dogmatic about any one thing such as any one specific diet. It’s acknowledging that bio-individuality exists, biodiversity exists and we’re not all meant to eat or live in a certain way or certain space. We’re all super, super unique beings and that’s not honored in the health world and a lot of places. There are a lot of labels and I think the labels are for containers and folders, right? People don’t need labels. I love your story, how you and the Wellness Wonderland started and evolved. I have a similar story about how I went from architecture to holistic architecture and spaces, and it’s definitely part of my personal journey. It is truly amazing how the universe guides your life and everything synchronizes holistically. You know you’re taking the right path because one thing supports the other and touches every aspect of your life. I have never really spoken about the Wellness Wonderland while taking everything into account like that. I could very easily just say, “Oh, it’s a space for wellness and happiness,” right? But I think it’s important to tell my story fully. In every person’s journey, that’s really true! Everyone has the hero’s or heroine’s journey, as Joseph Campbell says. All the puzzle pieces fit together so perfectly when looking at the story and looking back on where you’ve been. However, when you got started, you probably had no idea that A would lead to B which would lead to C. Like for me, I studied broadcast journalism in college. I’m not a TV news reporter like I wanted to be, but all those radio classes I took ended up helping me for the Podcast. I would have never imagined that. Just like that, it all works out. It’s cool to see that looking back. What are three tips for readers to create their own Wellness Wonderland? I think this tip alone can get you really far. When you’re mindful of what you’re doing and you’re really there, that’s when your life becomes a meditation, right? In a recent interview, Oprah asked the Buddhist monk Thich Nhat Hanh “How often do you meditate?” He responded: “I don’t meditate every day, I meditate every moment.” When your life can become a meditation and you can be fully present when you’re chopping vegetables or folding laundry or driving… When you are really present while having a conversation or an argument or whatever you’re doing.. When you can fully be there, you can bring your best self. I think we spend so much time multi-tasking. I’m a freakishly good multi-tasker, but there’s something to be said for mindfulness and presence and just being fully there. Don’t judge yourself! You’re going to mess up all the time, like literally all the time! I mess up, but I try not to beat myself up about it. But this is the practice! Because sometimes I do judge and beat myself up. But it’s silly, and regretting anything is a waste of time. I think that you can be loving towards yourself and speak to yourself kindly. It will take you far and genuinely make you happier. We often speak to ourselves really meanly, right? We can be really mean to ourselves and speak in a way we would never speak to a child; we would never speak that way to the ones we love. So talk to yourself like someone you love and stop judging yourself. The final tip, and I could give a billion tips, but the biggest thing is to be authentic. Be who you actually are. Be vulnerable. All people want is for you to be real with them. We go around our lives trying to paint ourselves a certain way. But people are pretty perceptive and even the least perceptive person can pick up on that. People can smell when you’re being fake a mile away. It doesn’t feel good for them and it sure doesn’t feel good for you, so you might as well be real. The people who like you are the ones you want to be around anyways. The people who don’t, you weren’t meant to be around them to begin with so it’s a win – win. AND… the real you is perfect. 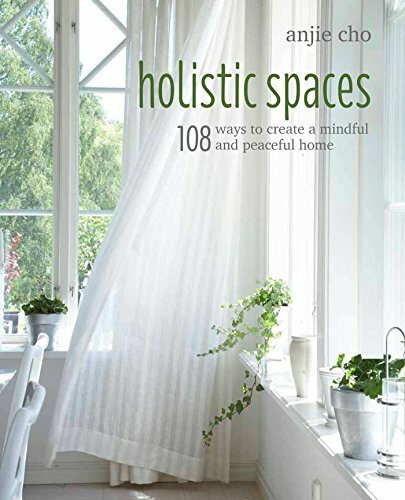 So Katie, how do you create holistic spaces in your home and workspaces? Yay! I love this question so much because I never get to talk about this but it’s really important to me! My taste is minimal. I really appreciate minimalism and I de-clutter as much as possible, almost to a fault. I like to keep things simple because choices really stress me out. If I can have things as simple and as clean as possible, it's really advantageous. I have an altar, which is also my bookshelf, with a heart that I made from scrapbook paper. It’s on my wall and I love it. It’s a focal point for my room. (see above!) The colors that I really like are white, gold and black with pops of other colors like pink. I really just try to keep everything really minimalistic, spacious, open and clean. I love all the feng shui tips that like I’ve gotten from you. I absolutely love feng shui and strive to think about it in every decision I make. Even when I go to work in a coffee shop I’ll sit in the commanding position. It’s always in the back of my mind. I try to face the door like you taught me and I’m trying to use all my burners. I really, really take it to heart, and it’s really impacted me. Check in next Sunday for the rest of the interview where Katie talks about Enlightened Eating and incorporating new wellness habits for the new year!